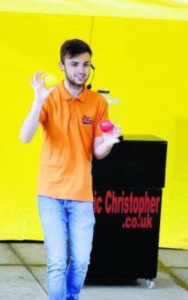 The Amazing Magic Christopher’s fun shows feature Magic, Balloon Modelling, Barney The Bird and lots and lots of audience participation & fun. her, one of the best Children’s Entertainers around! Magic Christopher specialises in children’s parties with magic. So if you are looking for a Children’s Entertainer, Children’s Magician, Balloon Modeller and DJ don’t forget, book Magic Christopher for your next party or event.